In contemporary society technological advances have allowed the Internet users to surf the Web whilst out and about on their mobile phones. For this reason, it is very important to devise a mobile device friendly blog or website. Mobile users are looking for a mobile site where they can search and navigate with ease. Taking this all into consideration, here are top tips to help you to optimise your site for mobile device users. 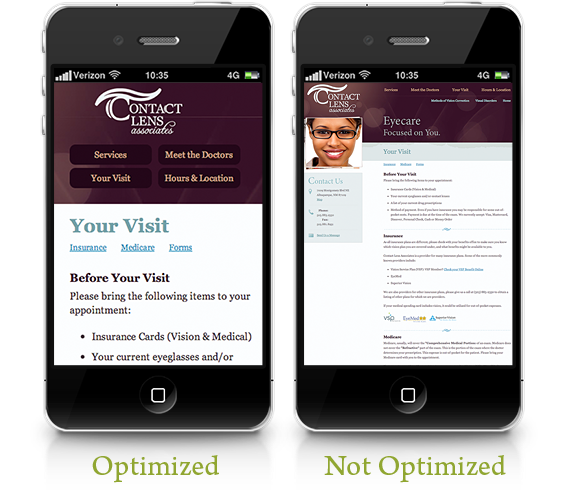 When creating a mobile site it is always a good idea to inform your readers that you have their interests at heart. It's always better if you create a separate URL designed specifically for this mobile version of your site or blog. Setting up a mobile domain can be done very quickly by simply adding a sub-domain to your current site. It is important that you manage to keep your pages small as the maximum page size permitted on a mobile device is just 20kb. When possible keep your page size at around 10kb and this will subsequently ensure that the page loads quickly. You will need to consider that the screen on the majority of mobile devices is rather small. With this in mind, you will want to centre your content where possible in order to aid your readers and ensure that they do not need to continuously scroll in order to view images or read long sentences. When creating a mobile friendly version of your blog you should always remember to keep the number of images relatively low. This is because images can increase loading time and never look as good tiny on a mobile device screen. If you want to upload some images ensure that they are in jpeg, png or gif format. You must always ensure that your content is focused and easy to read. Organization is key; post new or popular topics at the top of the page and avoid fonts and colours that can be difficult to read. Navigating a website on a mobile device is not always easy, so you will be required to make it as easy as possible for your users. Add back buttons on each page and include links to all of your various pages in order to aid navigation. By taking note and employing these top tips you will almost certainly increase the mobile traffic to your blog or website. Just remember to put your mobile site to the test, ask friends and family with smartphones to view your mobile site and give you constructive feedback. Thanks to Mary Johnson for this interesting guest post.